We worship God in Trinity, glorifying equally the Father, Son, and Holy Spirit. 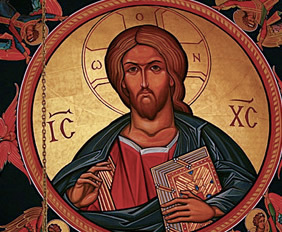 We believe that the Lord Jesus Christ is Son of God, begotten of the Father before all ages; that He is truly God, of one essence with the Father and the Holy Spirit. We believe that Christ Incarnate is also truly man, like us in all respects except sin. We worship the Holy Spirit as Lord and Giver of Life Who proceeds from the Father. We honor and venerate the Saints as those who have grown “unto the measure of the stature of the fullness of Christ” (Ephesians 4:13). We ask their intercession before God knowing that they live in Christ and that nothing, not even death, breaks the bond of love we share with them in Christ. Of the saints, the Ever-Virgin Mary, the Theotokos (Greek: Mother of God), holds a special place as “more honorable than the Cherubim and more glorious beyond compare than the Seraphim” (c.f. Luke 1:48). Baptism and Chrismation are usually administered together. Baptism by triple immersion is participation in the Death and Resurrection of Christ, purification in the washing away of sin, and birth into the life of the Holy Trinity. Chrismation, following Baptism, anoints one with the “Seal and Gift of the Holy Spirit.” Through the Holy Spirit we are able to live the fullness of the Christian life. We are regenerated and given the Grace by which we are able to keep the commandments of Christ and attain unto the Kingdom of Heaven. In Holy Communion is received the very Body and Blood of Christ for remission of sins, the sanctification of soul and body, and for life eternal. In Holy Confession the Christian, when truly repentant, receives from Christ,through the confessor, the forgiveness of sins committed after baptism. Ordination, Marriage, and Holy Unction complete the seven New Testament Sacraments. By the laying on of hands a bishop transmits Divine Grace to the person being ordained, linking him to the uninterrupted succession of Orthodox clergy from the time of Christ to the present. Divine Grace sanctifies the union of man and woman in matrimony. 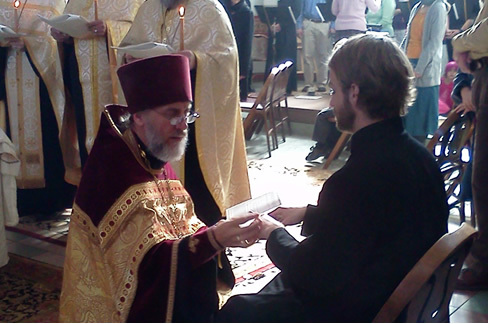 Orthodox parish priests are usually married but the marriage must precede ordination. The Sacrament of Holy Unction brings healing to the infirmities of both body and soul, as God sees fit, through the anointing of oil.